The new SEAT Leon is a powerful and emotional personality, and the most beautiful way to drive a functional car. The Leon has been completely redesigned from the ground up and is packed full of high-end technologies – in its driving assistance systems, in infotainment, in its chassis and drive. The engines combine powerful dynamics with outstanding efficiency. The availability of full-LED headlamps on the new Leon is a pioneering move by SEAT; being the first to offer this innovation in the mid-size segment. This technology combines stunning design with exceptional illumination. “The new Leon condenses all the strengths of the SEAT brand more than ever before. It is a car with sporting character and wide-ranging strengths. It brings quality and technologies from the full-size class into the compact segment. The Leon is a decisive step in SEAT’s brand and growth strategy. It will be launched towards the end of this year as a five-door and will subsequently grow with further variants into a fully-fledged family” says James Muir, President of SEAT S.A.
Every power unit is among best-in-class for efficiency and emissions. The highlight here is the Leon 1.6 TDI with start/stop system. It has an average fuel consumption of just 3.8 litres per 100 kilometres and an estimated CO2 figure of just 99 grams. 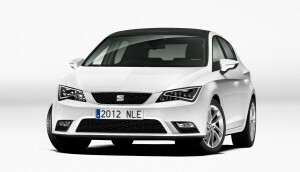 “The new Leon is an all-new car and opens a new chapter for SEAT. It combines SEAT’s dynamic new design language with the latest technology. Fine details and precise design, especially in the interior, reflect the high standard of craftsmanship of the new Leon,” explains Dr. Matthias Rabe, Vice-President of Research and Development for SEAT S.A. The angular line of the headlamps is a typical feature of the new SEAT design language, while also being perfectly integrated into the Leon’s sculptural form. Full-LED lights are available for the first time in the compact class. The new headlamps give an unmistakable look to the front end of the Leon. Additionally, the new Leon now has a distinctive signature appearance thanks to the fitment of LED daytime-running lights. From the side, the new SEAT Leon looks like a precisely executed sculpture on wheels. The characteristic, unbroken “Línea Dinámica” runs rearwards over the wheel arches. It is reminiscent of the tension of a well-trained muscle. The trapezoidal C-pillars are characteristic to the Leon, as are the short, upwards-pointing third windows. The rear end of the new SEAT Leon has been intensively modelled; the large logo serves as an opener for the rear hatch. The slightly wedge-shaped rear light clusters underscore the breadth and are also available in LED technology. The elegant exterior design of the new Leon continues into the interior, which has a clear, light and uncluttered look. The dashboard is unconventional and elegant, with a two-tone design that makes it appear to float in mid-air. Fine details underscore the Leon’s high standard of craftsmanship – details such as the large air vents, the controls for the air conditioning and the three-dimensional form of the trim elements. The luggage compartment has a volume of 380 litres, around 40 litres more than the preceding model. The new SEAT Leon uses a new vehicle architecture that enabled development engineers to position the front axle 40 millimetres farther forward. The results are a longer wheelbase and a balanced distribution of axle load – factors that significantly benefit comfort and sporty handling. The 1.6 TDI generates 77 kW (105 hp) and 250 Nm of torque. In the Ecomotive version with start/stop system and recuperation, it consumes just 3.8 litres of diesel per 100 km on the NEDC, equating to 99 grams of CO2 per km. The extensively re-engineered 2.0 TDI consumes an average of just 4.0 litres of fuel per 100 km in the Ecomotive version. With 110 kW (150 hp) and 320 Nm of torque, it is a powerful driving force for the Leon. SEAT will rapidly expand the engine line-up. Early 2013 will see the arrival of the 1.2 TSI in two versions with 63 kW (86 hp) and 77 kW (105 hp), a 1.4 TSI with 90 kW (122 hp) and, at the top of the petrol range, a 1.8 TSI with 132 kW (180 hp) and a combination of direct and manifold injection. The diesel line-up will be augmented by the 1.6 TDI with 66 kW (90 hp) and the new top TDI – the 2.0 TDI with 135 kW (184 hp). It delivers a maximum torque of 380 Newton metres. 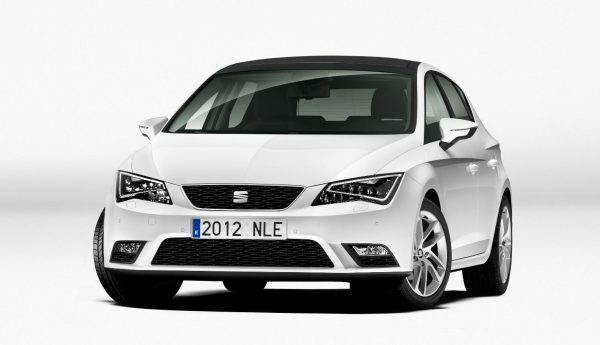 The chassis of the new SEAT Leon scores high for its sporty and agile character. Its front suspension features a MacPherson front axle with subframe, while the rear of the new SEAT Leon features torsion beam suspension for engines up to 110 kW (150 hp). The more powerful variants use a multi-link construction that handles longitudinal and transverse loads discretely. The entry level is the Media System Touch – featuring a radio with a card slot and four speakers in the Reference line with a 5” screen. Style and the FR come with the Media System Colour with more in-screen colours and higher quality, and featuring a CD drive and six speakers as standard (eight speakers in the FR); it connects external devices via Bluetooth, USB or aux-in. Its 5-inch, colour touchscreen also controls vehicle functions. The Media System Plus systems has a 5.8-inch touchscreen with three-dimensional graphics in high definition, iPod connectivity, an optional DAB tuner, and voice recognition. The system comes with eight speakers. The top solution incorporates the navigation system, which also shows navigation information in the colour display between the speedometer and rev counter and can be controlled by voice recognition. The SEAT Sound System audio has a clear, crisp sound reproduction thanks to its 10-speaker and sub-woofer set-up. The new Leon also sets benchmarks when it comes to the available driver assistance systems. The drowsiness detection feature recognizes when the driver is losing concentration and suggests taking a break. Additionally, an advanced camera mounted behind the rear-view mirror manages both the Full Beam Assistant, which switches automatically between full and dipped beam, and the lane-keeping assistant Heading Control which makes slight corrections to the electro-mechanical power steering to prevent the driver from crossing over lane markings. “With the all-new Leon, we have designed and developed a car which perfectly captures the meaning of Enjoyneering. This compelling mix of design, technology, athletic performance and premium quality is certain to seduce existing customers, as well as bringing a new generation of car-buyers to the brand,”says James Muir, President of SEAT S.A. The new Leon is expected to go on sale here in February 2013 with pricing very much in line with the current Leon range. Prices will start at under €20,000. More information on specification and pricing will be released at a later stage. “We are particularly excited about the arrival of the new Leon next year as it is an iconic car for the SEAT brand and has a huge fanbase. I think most will agree that the new car is beautiful and it is the perfect example of the rebirth of the SEAT brand Internationally and this new car will be the cornerstone of the brand’s renaissance here in Ireland” says Adam Chamberlain, Brand Director, SEAT Ireland. Another all-new element of the Leon is the logo on its grille, rear and steering wheel. The Leon will be the first car to wear the company’s newly refreshed signifier. Sporting a cleaner, purer design, the new SEAT logo represents the precision and elegance of the brand’s design language, while also reflecting the company’s engineering and quality leadership. The introduction of the new SEAT logo across all of the company’s visual material and locations will begin from Paris Motor Show in September. SEAT is the only company in its sector with the full-range capacity to design, develop, manufacture and market cars in Spain. A member of the Volkswagen Group, the multinational has its headquarters in Martorell (Barcelona), exporting approximately 80% of its vehicles to 75 countries. SEAT is market leader in Spain, and in 2011 had a total turnover of more than 5.0 billion euros, with overall deliveries amounting to 350,000 units. SEAT Group employs more than 14,000 professionals at its three production centres in Barcelona – Zona Franca, El Prat de Llobregat and Martorell, where it manufactures the highly successful Ibiza and Leon, amongst other models. The Volkswagen Group production facility at Palmela in Portugal supplies the SEAT Alhambra and the factory in Bratislava (Slovakia) manufactures the SEAT Mii.